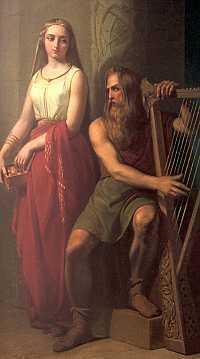 Iðunn is the goddess of eternal youth and is the wife of Bragi, the god of poetry. Idun keeps the golden apples that maintain the eternal youthfulness of the gods. Since the gods are not immortal, the apples are considered very precious. One summer day, Óðin, Loki, and Hnir were walking across Miðgarð. Hungry at the end of the day, they came upon a herd of oxen. Loki slaughtered one while Óðin and Hnir built a fire. After roasting the meat for what seemed like a long time, the meat was just as raw as when they put it in the fire. A large eagle perched in a tree observed all this and proposed a bargain. If the gods would let the eagle eat first, the ox would be cooked. The gods agreed, seeing no alternative. The eagle swooped down and snatched the lion's share of the ox from the fire. Landing nearby, the eagle began to eat greedily. Loki was so angry at the theft of their evening meal that he rammed his staff into the eagle's body. The eagle flew off at great speed. Loki found to his dismay that the staff was firmly lodged in the body of the eagle and that he was unable to release his hands from the staff. The eagle flew low enough to make certain that Loki's ride was uncomfortable. His legs banged into boulders and he was nearly ripped in two. Loki begged for quarter. 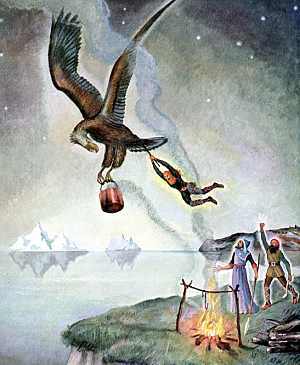 The eagle said he would release Loki only if Loki would swear to bring Iðunn and her apples out of Ásgarð. Now, Loki knew that the eagle could only be a giant in disguise. Crazy with pain, he swore the oath. Back in Ásgarð, Loki convinced Iðunn to travel with him to Miðgarð. The giant Þjazi, again wearing an eagle skin, swooped down and carried Iðunn and her apples off to his castle in the mountains of Jötenheim, land of the giants. Here, Þjazi alone would enjoy the apples. Iðun's absence was quickly noted in Ásgarð. Without Idun's apples, the gods and goddesses began to grow old and gray, and their powers declined. Gathering his remaining strength, Óðin called the gods to council. Someone remembered that Iðunn was last seen with Loki. The gods sought out Loki and bound him, demanding that he find a way to return Iðunn and her apples or else face death at the hands of the gods. 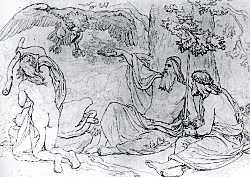 Loki agreed to make the journey to find Iðunn and her apples. Using a hawk skin to fly, he traveled to Þjazi's castle in Jötenheim, where he found Iðunn alone, huddled over a smoky fire. Saying the magic words, he turned Iðunn into a nut. Grasping the nut between his claws, Loki flew off, back to Ásgarð. Þjazi, returning to the castle from fishing, found Iðunn gone. He knew that only one of the gods could have stolen her back. He donned his eagle skin for a third time, and flew to give chase. Back at Ásgarð, the gods could see the hawk struggling to outrun the eagle. Realizing the situation, they piled wood shavings and kindling against the wall of Ásgarð. Loki and Idun flew over the wall as the gods ignited the wood. The eagle could not avoid the flames, and his wings were destroyed. He fell to the ground in torment, and the gods quickly killed the eagle. Loki threw off the hawk skin. Picking up the nut, he spoke the magic words again. Iðunn moved among the aging gods and goddesses, offering them the apples that would restore their youth.